Indulge me for a moment of Trek-geeking. 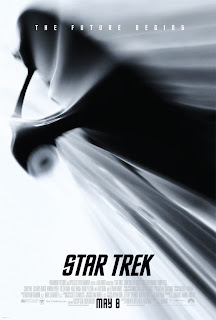 I really like the look of this poster for the new Star Trek film. I've been trying not to get too excited about the film itself, because this franchise has delivered little but disappointment post-First Contact. The trailers look totally awesome, however. Jeff and I go to see a movie in a theater at best once a year, so this will probably be this year's pick. Even if this ends up being a fabulous re-boot of classic-era Trek, I have a nagging worry that they are going to retain one of the franchise's most classic behaviors: introducing discontinuity for no good reason. I've refrained from learning too much about its storyline in advance, but I understand that there is to be a villain named Nero who is evidently a Romulan. In the first season episode "Balance of Terror" a major point was made that the Enterprise's battle with the Romulans in that episode was the first such engagement in a century since the end of the "Earth-Romulan War." Furthermore, it was established that humans and Romulans had never actually seen each other face-to-face. That's why it was a big shocker when Spock hacked the Romulan ship's com system and pulled over visual images showing, for the first time, that Romulans look like Vulcans. So I'm going to frown in dismay if this huge piece of Trek lore is ignored in a story set some years before "Balance of Terror" but obviously well after the Romulan War. If you're not a fan, this may sound trivial, but trust me: it is a big freaking deal in the history of that universe--and just the sort of thing that a Trek movie screenwriter and director would miss. Oh wait, I know how it will all be explainable. They'll use the oldest trick in their bag: time travel! What REALLY honks me off with the dicontinuities are things like Zefram Cochran launching from Earth in First Contact. According to the original timeline and a few books, Cochran was a colonist at Alpha Centauri when he launched. And the scenes of the Enterprise being built on Earth... It was never designed to even enter a planets atmosphere, let alone land or be launched from the surface. ARRRGGHHH!!! Where is Michael Stracynzki when we need him? Meh. I fully understand the urge to be geeky about the changes that may get made in the reboot (I can go on for hours about that when it comes to comic books), I for one don't care if it fits in with what little I know about Star Trek history. I just plain want a good Star Trek movie. I want to stare at the screen and say "wow" so many times I lose count. I haven't really felt that way about a Star Trek movie since "Undiscovered Country." Yeah hopefully it will just be good, at least. I suppose the discontinuities will be less intrusive for me if it ends up being a substantially "new" thing kind of like the newer Galactica series where they kept the bare bones of the premise but changed just about everything else. I don't have the impression that it's intended to be quite that much of a re-imagining however. I guess we'll know in a few weeks. I could be goaded into more talk of this but I need to go to the job now! Another thing that I would add about the Star Trek movie is that even if it ends up being somehow lacking in other respects, the new Captain Kirk is what I would consider HOT! Can't it ever be BOTH :) Jeff has not given his opinion on it yet, but I suspect that if pressed to choose, then he would go for Spock--he's a big Heroes fan and so he knows and loves that actor best as the sinister Sylar. I like the fact that Hero's has several ex-Trek members.... Sulu, Uhuru, Flint... anybody else? Flint? Do you mean the Flint character from the 3rd season Trek episode "Requiem for Methusalah?" If so, I think that was James Daly, and I think he's been dead for many years, but I could be wrong. I guess you are going to cause me to make a Wikipedia run. Another Trek/Heroes connection that I can think of is Malcolm McDowell who was the villain in the ST: Generations movie...but what HASN'T he been in! Also, Dominic Keating (who played that annoying British dude on the Enterprise series) has been on Heroes as well. I am with Derek on this but only because I only have so many brain cells available and can't hold all the Trek trivia right there in my head. If I had this filling my brain like Chris does, the changes would probably grate on me. Of course, I am fairly good at Dune and plenty entertained by all video versions. Then let me ask you all what you think of the Dune move and the remake that SciFi did? My bad... you are right, Cris. But when I look at pix of them side by side, they look a lot alike! I love the Lynch movie--it's a big fave around here. I know Pat will agree. (I don't care what everyone else in the world said about it). I'll consume any Dune product that they want to feed me, but I'll say that the SciFi version of the first book has some problems. I was excited about it on first viewing but it doesn't hold up real well on repeat viewings. On the other hand, I think the CHILDREN OF DUNE show was excellent. Chris and I have been together on this Dune thing so long our cycles are matching. If I remember correctly, due to our work schedule, Chris had taped all of the first mini-series so we could ingest it all at once. While attempting the marathon viewing, we got a bit on the drunk side and made jest of the entire thing...I was just thinking that I am due to read some Frank. Tor has a reread review up of The Dosadi Experiment and I didn't remember one detail of that story. Speaking of Dune, have y'all heard that there is supposedly a new film adaptation directed by Peter Berg (Friday Night Lights) scheduled for next year? A quick scan of the net about it showed me some sort of old info about it that I had seen some months ago, but I didn't see anything new indicating whether it was still happening, nor anything about it being cancelled. But that could be really cool to see yet another film of this. I still think that one cannot fully "get" Dune from a movie without having read it. I know a lot of people just wanna watch a movie and don't like hearing some tedious bookworm like me insisting that you have to read the book first...but with this one, people are really missing out. I think the Lynch movie was better appreciated by the readers than by the lay-audience in spite of its variations from the book's content.